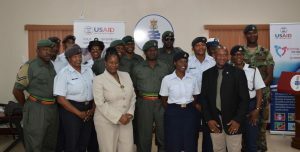 BASSETERRE, St. Kitts – Ninety-six uniformed security forces and service providers in juvenile justice in St. Kitts and Nevis were encouraged to use the recently completed two weeks of intense training aimed at sensitizing law enforcement officers on the juvenile justice reform process as a stepping stone for dealing with juveniles. Azilla Clarke, focal point for the Juvenile Justice Reform Project (JJRP) in St. Kitts and Nevis, thanked the representatives from the OECS Commission – Leonard Terrance and Magistrate Gloria Augustus – for offering the training to the officers. She also expressed thanks to the participants for the effort they placed in ensuring that they are up-to-date with juvenile justice reform in St. Kitts and Nevis, especially where the act is concerned. 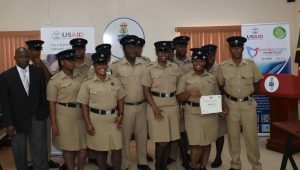 Under the USD$5.8 million regional project, St. Kitts and Nevis received USD$900,000 to support reform efforts, including the provision of training, capacity building, and technical assistance to the New Horizons Rehabilitation Center, the Magistrates Court and the Department of Probation and Child Services. More than 150 juvenile justice officials and media personnel were also exposed to child-centered techniques, tools and modern approaches to improve the care, treatment and advocacy for vulnerable youth. The Juvenile Justice Reform Project 2 targets youth aged 18 and below who are in conflict with the law; that is, who have committed offences for which they could be prosecuted under the existing legislative framework in Antigua and Barbuda, Commonwealth of Dominica, Grenada, Saint Lucia, St. Kitts and Nevis and St. Vincent and the Grenadines.